Robert Koehler of Tribune Media Services writes : "The Silent Scream of Numbers"
"It’s time to blow off the dust and start paying the price. "I just got back from what was officially called the National Election Reform Conference, in Nashville, Tenn., an extraordinary pulling together of disparate voting-rights activists — 30 states were represented, 15 red and 15 blue — sponsored by a Nashville group called Gathering To Save Our Democracy. It had the feel of 1775: citizen patriots taking matters into their own hands to reclaim the republic. This was the level of its urgency. Akron Beacon Journal reports: "Prosecutor to Probe Cuyahoga County Recount"
"CLEVELAND - Erie County Prosecutor Kevin J. Baxter is investigating whether the Cuyahoga County Board of Elections broke the law in its recount of ballots from the November presidential election. 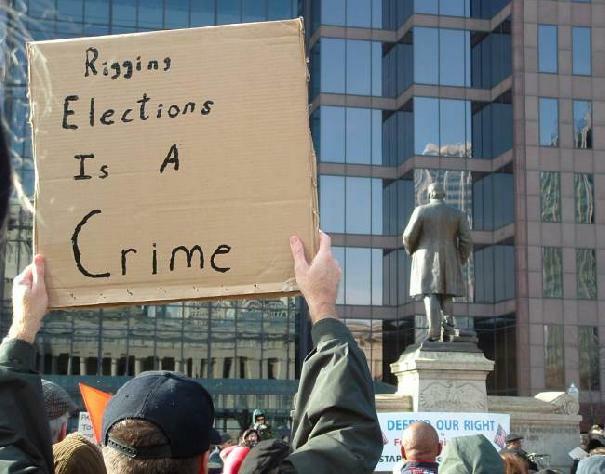 "Cuyahoga County Prosecutor William Mason appointed Baxter as a special prosecutor in the case because the board of elections is Mason's client, which could pose a conflict of interest, said Mason spokeswoman Jamie Dalton. "Baxter said he didn't know yet whether the allegations have any validity. He said his investigators will begin interviewing people in the next several weeks. "The probe stems from two requests written to Mason: one from minor-party presidential candidates David Cobb and Michael Badnarik, and another from entrepreneurial consultant Edward Michael Caner.